Have you ever encountered such a situation, when you try to restore your iPhone backup, you are required to enter a password, but you get the password incorrect message after you enter thecorrect backup password. You may get confused and wonder what the iPhone backup password is and how to recover it when you can't remember it? Just read this post and get the answer. Part 1: What Is My iPhone Backup Password? 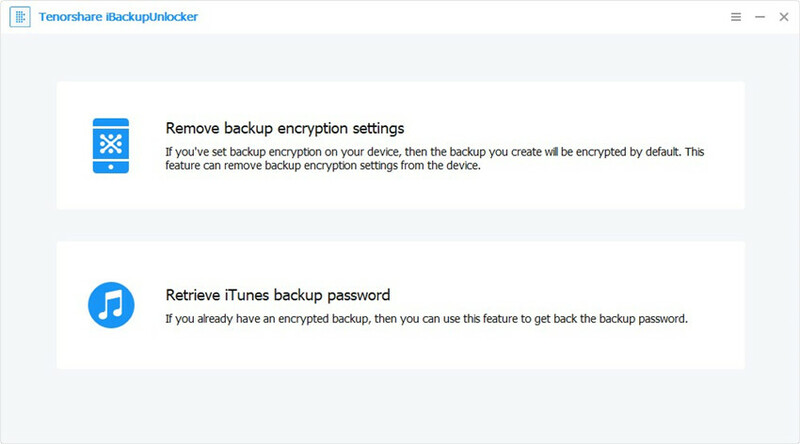 iPhone backup password is a password that is used to encrypt your backups such as the iTunes backups. The iPhone backup password could be different from your passcode and your Apple ID password. iPhone backup password is solely used to unlock your iPhone local backups. Now, what if you forget your iPhone backup password? You will neither be able to access your backup nor restore them. In this part, we will show you 4 different methods on how to recover or remove forgotten backup password for iPhone XS/XS Max/XR/X/8/8 Plus/7/7 Plus, let's check it out. If your iPhone is running iOS 11 and above you need to consider removing iPhone backup password. Just follow these simple steps. Step 1. Take your iPhone which you have forgotten the backup password and head to Settings. Step 2. On "Settings," tap on "General" and then tap on "Reset" button. Step 3. Next, tap on "Reset on All Settings",and you will have removed the iPhone backup password including another setting like brightness without losing data. The second method that you can use to remove iPhone backup encryption is by using Mac Keychain users to recover iPhone backup password. The Mac keychain method is ideal if you had saved your password to Keychain on your Mac. If so, then follow these simple steps. Step 1. Open the Keychain Access application on your Mac. Step 2. Next, you need to choose the Password category that is on the right sidebar. Step 3. You can search for the keychain backup on the search field available. Step 4. Now, click on an item labelled 'iOS Backup' or 'iPhone Backup'. From there, you have to distinguish which device an item relates to, look at the Account field. Step 5. From there take the item with your device's UDID and then double click on it to display the Password. This method is useful since you will be able to restore your iPhone backup password and use it to reaccess your backups. The third solutions that have worked with some of iPhone users are trying to open with the administrator password. Some users have been successful with these methods. They claim that iTunes automatically set your Windows or Mac administrator password as a backup password if never created iPhone backupencryption. However, there is no actual proof to this and Apple emphasizes that iTunes doesn't encrypt your backups by default. But let us face it, there is nothing to lose you can give it a try. The last and effective method that is recommended after trying the three methods without success is retrieving iPhone Backup password with Tenorshare 4uKey - iTunes Backup software. The Tenorshare 4uKey - iTunes Backup software is a software that allows you to recover iTunes password in three ways; brute force attack, brute force with Mask attack and Dictionary attack. It can also remove all the encrypt iPhone Backup password while securing your phone's data. Step 1. Visit Tenorshare website, download 4uKey - iTunes Backup and install in your computer. Step 2. Next, you need to open the software and then select "Retrieved iTunes Backup Password" option. Step 3. On the next window that will appear you will see a list of backups. Choose the iTunes backup list that you want to retrieve the password and click on the "Next" button. Step 4. Now, you have to choose the recovery mode that you want. The "Dictionary Attack" allows you to retrieve passwords quickly from an inbuilt dictionary or customised dictionary. The Brute Force with Mask Attack is ideal if you still remember some characters of the forgotten password. And lastly, there is Brute Force is perfect when you cannot wholly remember any characters of the forgotten password. So, choose the preferred recovery and move to the next step. Step 5. Lastly, click on the "Start" button and the program will start retrieving your password. The time taken to recover the password depends on the length of the password. A password that is less than four characters is retrieved faster,unlike longer passwords. When it comes to iPhone backup password retrieval, it is with no doubt you have different ways to restore it. You can erase the settings use Mac Keychain or try using the administrator password.However, the best choice is using Tenorshare iPhone backup unlocking software because it has different recovery modes and you are sure to retrieve passwords without data loss.